This is a once or twice a year kind of recipe; it’s rich but worth it occasionally. Candied Bacon is not something you would want to eat every day, but sometimes it’s a fine spicy sweet treat. Personally, I adore the combination of spicy kicked off with sweet whether it’s chocolate or cookie or even a spicy hot cocoa mix. This recipe is a new one for me, I don’t usually eat a lot of sugar, but as I said once or twice a year, there is a call for Candied Bacon. Some people call this Pig Candy, and I yeah I can see why! It’s perfectly easy to make too, that’s practically a standard for me you know. You mix sriracha and brown sugar, warm it a little and spread it over bacon and cook. Probably the worst part of the whole procedure is cleaning up the baking rack you cook it on. That’s a sticky, gooey mess that is best soaked right away and scrubbed with a good stiff brush. Do not let it sit or it will become a semi-permanent part of the rack — personal experience talking there. Bacon Candy or Pig Candy-It’s all good! 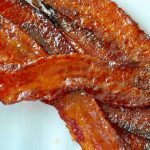 How to use Sriracha Glazed Bacon? Oh, so many fun uses. Take it as swap item for a Food Swap, someone brought it to Palmer Food Swap, and it was a HIT. Crumble it and toss it on a salad, you’ve never had bacon bits like that before. 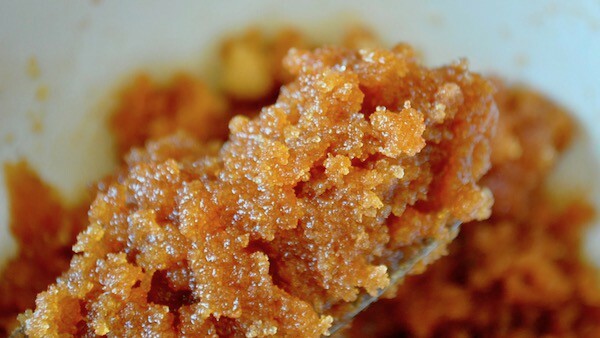 You can also eat it just straight plain, like bacon candy. Use it to top something sweet; you wouldn’t regret that for one minute. Check out my Candied Bacon Bark Recipe! What sriracha to use?? Well apparently everyone thinks of their favorite rooster sauce when you mention sriracha. But you can make your own and thus alter the spice or salt level as you prefer. 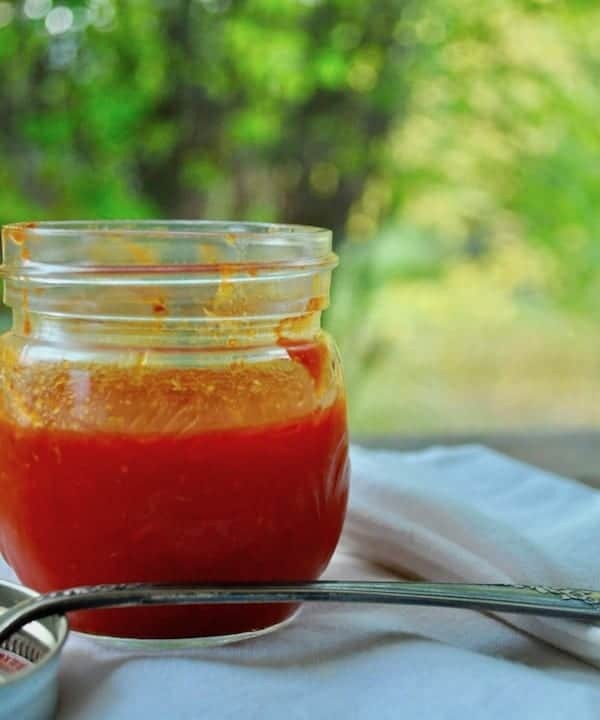 I have a few recipes to choose from like this classic Sriracha or a more creative spin, Mango Sriracha. Both provide heat and flavor that you control so try those if you like.  You could probably even use just any hot sauce you happen to have on hand. Buffalo hot sauce would be an interesting take on this recipe. Have fun! 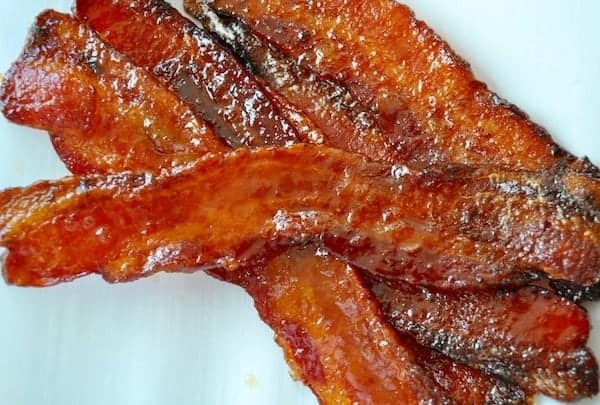 Sriracha Glazed Bacon is definitely a spicy, decadent way to step up your bacon game. Use it anywhere you use bacon for a hot, sweet kick of flavor. Mmmm I bet this is amazing!! I will have to make this for Ethan!